Recently I came across this nifty utility called conky, which displays information about the system on the desktop. It's light-weight and highly customizable. Everything is controlled via the .conkyrc file in the home directory, and the settings are quite intuitive. Installing conky is a breeze. Just grab the source from http://conky.sourceforge.net/ and do the make dance. My Fedora 8 system by default didn't have X double buffering enabled. If you start to see some flicker or if the text gets garbled, open up xorg.conf and add the following line to the Modules section. Load "dbe" Restart X afterwards to enable the setting. 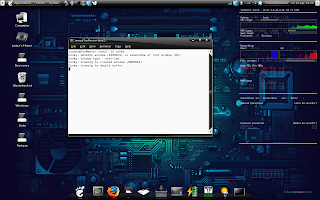 http://conky.sourceforge.net/screenshots.html lists several conky configurations with screenshots. Just download what you fancy and save it in the home directory as .conkyrc and restart conky to see the results. You can customize the setup by editing conkyrc, it's quite intuitive. If you have done any HTML+CSS coding before, you'll be right at home with the conky syntax. http://conky.sourceforge.net/variables.html Lists available conky variables and http://conky.sourceforge.net/config_settings.html lists the config settings. You can also try the man pages for reference. I am posting my conkyrc below for backup purposes. # Print everything to stdout? # Maximum number of special things, e.g. fonts, offsets, aligns, etc.